Roasted sweet red bell peppers, artichoke hearts, and green chilies lend this paella an interesting array of flavors, and contrast nicely with the mild taste of scallops. This paella can be garnished with lemon wedges, or with additional roasted red peppers arranged in a pattern over the rice. Heat half the olive oil in a paella pan over medium to high heat. Add the scallops and sauté for 3 minutes. Set the scallops aside and discard the pan juices. Add the remaining olive oil to the pan, and cook the onion and garlic for about 5 minutes over medium heat. Add the rice and cook for a further 5 minutes. Mix in the broth, saffron, salt, and pepper and cook for 10 minutes. Add the roasted red bell peppers (reserving a few for the garnish, if wished) and the chilies and cook for a further 10 minutes. Add the artichoke hearts and scallops and cook for 5 minutes, or until the broth has been absorbed and the rice is tender. Garnish with lemon wedges or additional roasted sweet red bell pepper strips, and serve. 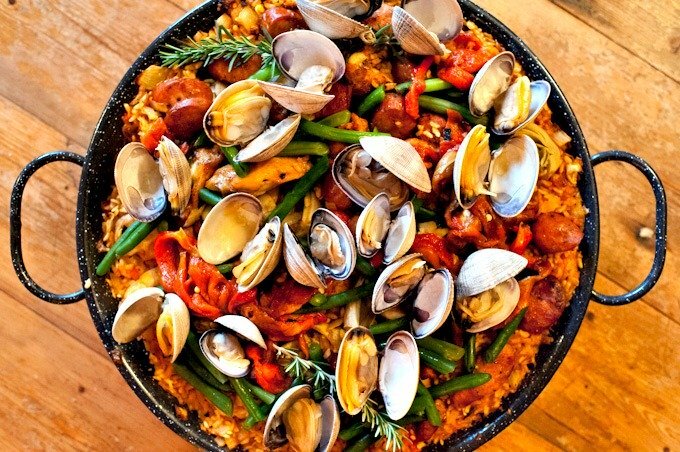 Paella recipes: There are literally hundreds of paella recipes and every cook has their own favorite recipe. At Spain-recipes. com we've collected some of our favorite paella recipes, we recommend trying them all to discover the full variety of Spanish Paella!!! In Galicia, the meat used for this recipe is the lower portion of the front pork leg, or hock, and it's salt cured. I prepare it with fresh hocks, and it's also delicious. DURING THE HOT summer months, Spaniards look forward to their cuisine’s rich array of cold soups and salads.